The Tournament has been CANCELED! There weren't sufficient teams signed up to run an adequate tournament. Please check back next year. A tournament for recreational players! 1. 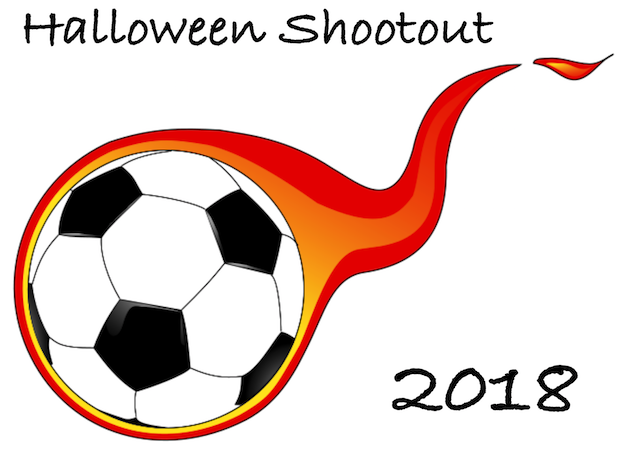 General: The Halloween Shootout is a Distict VI event for Class 4, Recreational players only, to be played under FIFA, USYA, and CYSA-North rules except as modified by the following. but they must be registered and playing in the same club as your team at the start of the 2018-2019 season. 3. Cancelation: In the event that the tournament is canceled, the tournament will refund the full amount of the tournament fees to the teams. Once a team has been notified of being accepted into the tournament, the tournament fee cannot be refunded. 4. Weather: In the event of extreme weather, the Tournament Coordinator reserves the right to modify the rules for the safety of the players, i.e., shortening game lengths or adding water breaks. Games can be modified, suspended or canceled in the event of unsafe field conditions, including but not limited to flooding and the presence of lightning. 5. Home Team: The team listed first on the schedule is the home team. The home team is responsible for changing jersey color if there is a conflict in the opinion of the referee. For championship and consolation games, the team with the highest point total shall be the home team. If teams have the same point total, a coin toss shall determine the home team. 6. Bench: Teams will occupy the same side of the game field during play. Spectators are to sit opposite their team. No coaching is allowed from outside the team area. 5 Team Bracket: Each team shall play the other four teams in a round robin format. Points will be totaled for each game. At the conclusion of the final game of the round robin format, places will be determined based on the highest point total. 2 Flight Bracket: The teams in each flight will play a round robin format. Teams with the highest point total for the bracket overall, after the 3 preliminary games, shall advance to the championship game. A consolation game to determine third place will be played by the teams with the next highest point total. 9. Games: Games shall start within 10 minutes of the scheduled time. Any team not ready to play within 10 minutes of the scheduled time (with the minimum required players for that age group) shall forfeit the game and the opposing team will be credited with a 2-0 win (9 points=6 for win + 2 goals + 1 for shutout). In the event that the referee feels a team is intentionally causing a delay in game, the referee may caution the team’s captain or coach. If delay continues, coach will be dismissed and points will be taken away from the team. If consolation game or championship game is tied at the end of regulation, the teams shall play one ten-minute overtime with the “Golden Goal” format. If still tied, the winner shall be determined by penalty kicks per FIFA rules and regulations (5 penalty kicks per team). Penalty kicks may be moved to a different field at the discretion of the tournament coordinator to accommodate the schedule. 11. Tie-Breakers: The following shall be used to break ties in point totals after the round robin games. 12. Sportsmanship: Good sportsmanship is expected from all!!! We are here to provide a positive experience for our youth soccer players and their families.Coaches are responsible for the conduct of their players, assistant coaches, parents, team officials and spectators associated with the team.No foul or abusive language will be allowed! No alcoholic beverages are permitted.No smoking is permitted.No pets of any kind (i.e., dogs, cats, rats, snakes, birds, etc.) are permitted at the tournament site. Any person violating the aforementioned rules or any policy set forth by District VI, CYSA or governing bodies can be ejected for the remainder of the tournament at the discretion of the Tournament Coordinator. 13. Ejections and Cautions: Any player or coach receiving a red card during the tournament shall be suspended for a minimum of 1 game. The Tournament Committee shall determine further suspensions if necessary. The referee will retain the player or coach’s pass and forward it to the Tournament Coordinator for appropriate action, including the respective District Commissioner if the suspension extends beyond the conclusion of the tournament. 14. Protests: All games will be considered final. No protests will be allowed. Copyright © 2001 - 2019 Citrus Heights Soccer Club. All Rights Reserved.